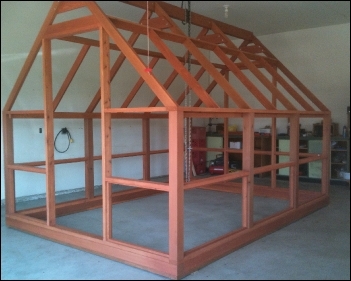 For those of you who have some building experience and are looking for a great woodworking project check out our detailed DIY hobby greenhouse plans. Build a freestanding 9' x 16' cedar wood framed greenhouse for under $3000. These plans are the same durable chalet design as the hobby greenhouse Sun Country sells as a kit and featured in the photographs below. We use Lexan Corrugated however there are instructions on how to attach Lexan Thermoclear polycarbonate twin-wall covering to the frame as well. The greenhouse plans are available for download worldwide. Plans package includes Email Assistance and Telephone Help Line. Please visit our sponsors below for deals on greenhouse accessories. 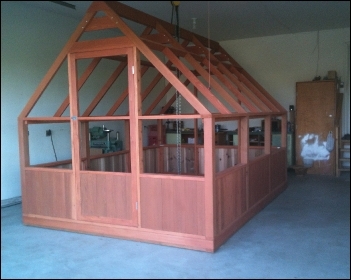 How to Build A Cedar Wood Framed Hobby Greenhouse. Tools Needed: You'll need a miter saw, table saw, compressor & nail gun, router, power screwdriver and a thickness planer to dress up the lumber (optional). These plans are very detailed with over 70 reference drawings and photographs. You won't find plans like these anywhere on the web. The best part is the "Help Line" while you build. Whom better to get advice from than the designer and builder of the Sun Country Greenhouse. For warranty items (Lexan panels and cedar knee wall) use the same Pay Pal link. Shipping is $17.95. For only $17.95, download our 8'8" x 16' greenhouse plans (worldwide). Telephone assistance for residents of Canada and USA only. Talk directly to the builder, there's no posting messages on a forum and waiting for a reply. If you are outside of the USA or Canada email assistance is available. Visit PayPal for more information about their services then order your freestanding span roof hobby greenhouse plans or warranty shipping. Click Here Once you're there click on the "buy now" link, PayPal will instruct you on how to download your plans. Please Note: Watch for the PayPal directions to our Greenhouse Plans Download page after the transaction is complete so don't close your browser. This is a Download Only, the greenhouse plans are Not mailed to you. Once again, when the transaction is complete PayPal will direct you to our webpage where you can download the step by step text, drawings and photographs. So don't close your Browser. However, if you do miss the PayPal instructions, email us and we'll send you the link. You'll get the step by step text, drawings, materials list, info on G.E. Lexan polycarbonate panels and building assistance. These greenhouse plans are not generic CAD blueprints you see on the web. You'll receive important information on attaching the twin wall or corrugated polycarbonate panels to the frame, how to cut the panels and tips on cleaning polycarbonate. Our sponsored links may provide great leads to local suppliers in your locale. It's very important to pick your own lumber making sure the pieces are straight, not bowed or crowned, and knot free. There's lots of construction photos for trim ideas several videos of our greenhouses on our YouTube Channel. We've also added some free DIY greenhouse plans and potting bench plans you can download at our gardening tips page. Visit our Photo Gallery for larger images. Lean-to: The most convenient of all greenhouses is a greenhouse that becomes part of your house or garage. Construction is easier and the structure is better braced because one wall of the greenhouse is actually your house or garage. You will find a simple 8' x 12' lean-to greenhouse that's framed with 2 x 4 redwood or cedar and covered with rigid Lexan polycarbonate panels at our Free Lean-to plans. Once the foundation is complete and all the supplies are on hand you and your helper can complete this "attached" greenhouse in a weekend. For energy efficiency it should be constructed around a door or window and insulated and caulked to prevent cold drafts. 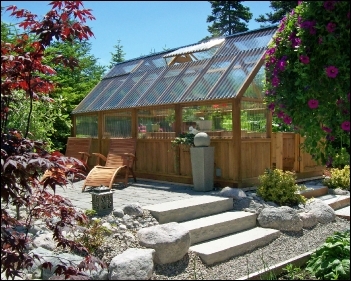 The main advantage of an A-Frame greenhouse is it is easy to build. The steep roof sheds rain, snow and debris and makes it easy to install the greenhouse covering you want to use (polycarbonate sheets) and shadecloth. This greenhouse is relatively light and can be moved easily if needed. Designed to resemble a barn a Gambrel greenhouse has sufficient structural strength to tackle average snow loads and is very popular with do it the yourself crowd. Vents are located on the end walls and if needed more vents can be incorporated into the side walls as louvers. A gambrel roof is a symmetrical two-sided roof with two slopes on each side. The upper slope is positioned at a shallow angle, while the lower slope is steep. This design provides the advantages of a sloped roof while maximizing headroom inside the building's upper level and shortening what would otherwise be a tall roof. Constructed in sections, this lightweight greenhouse can be covered with polyethylene plastic, polycarbonate, fiberglass or acrylic sheets. Free Gambrel Plans. A Gothic Arch greenhouse has two advantages it can be portable or it can be placed on a cement pad and anchored. Either way it should be anchored in some fashion as it has a light frame like the A Frame. It can be covered with polyethylene, acrylic, fiberglass or better yet polycarbonate panels. A Sun Pit Greenhouse uses the insulation properties of the ground to provide insulation and little need for supplemental heating. The roof can be framed with wood and glazed with dual or triple wall polycarbonate panels. A southern exposure will take advantage of solar heating as well paint the interior white to maximize the sunlight. Using a thermal mass like water barrels painted black or dark coloured stones will help keep the greenhouse warm at night. Check out our Free Solar Greenhouse plans page.